SOME of the borough’s best known writers say they are not using Camden’s libraries because they have too few books in them and are closed too often. Renowned author AN Wilson, pictured right, said yesterday (Wednesday) the state of Camden Town Library in Eversholt Street got so bad six years ago he started using Marylebone Library in neighbouring Westminster instead. 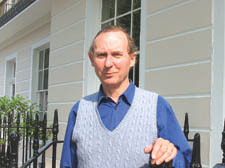 The columnist, who lives in Camden Town, also criticised Camden for selling off old stock, and complained that libraries were installing computers and IT leaflets at the expense of books. Poet Laureate Andrew Motion, also a Camden Town resident, said libraries needed to strike a balance between “old-style” and “new-style” stock. Beatles’ biographer Hunter Davies, from Gospel Oak, said libraries should offer computers as well as books – but not at the expense of books. “Libraries should have computers, videos and DVDs, but they should have books as well,” he said. Liberal Democrat leisure chief Councillor Flick Rea, whose cabinet portfolio covers libraries, challenged Mr Wilson’s view of the borough’s libraries. Cllr Rea promised a consultation on opening hours later in the year.